solid. In 1960, Bjerke started building boats in his first workshop and found a recipe for success. Fjord sales consistenty grew: By the early seventies, Fjord sales surpassed the sales of all other European motor boat manufacturers. Fjord Terne 21 is the smallest one in the family, small outside but big inside. For daytrips she takes 9 passengers, while 2 adults and 2 children can stay comfortably overnight. Fjord Terne 24 is a very seaworthy boat. Few boats of the same dimensions offer as much outside space and as many seats. It has bed-space for 4 persons. The boat is equipped with toilet and shower, pantry with cooker and electric cooling box. A bow thruster and electric windlass makes the handling of the boat easy. Fjord Terne 28 fulfills all your wishes for a coastal cruiser, an ideal boat for 12 passengers for day trips and a weekend boat that sleeps 4. The boat is equipped with toilet and shower, pantry with cooker, and electric cooling box. The noise level onboard is low. Fjord has always been known for producing exceptional motor boats. 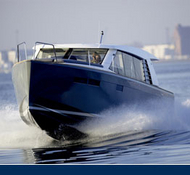 In its new designs, Fjord seeks to create something truly extraordinary that is why the Fjord 40' Cruiser was produced. 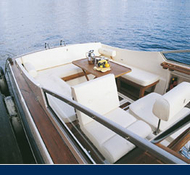 Fjord has always been known for producing exceptional motor boats. In its new designs, Fjord seeks to create something truly extraordinary, this is why the Fjord 40' Open was produced.